“More and more people are now living in extreme poverty. We have not felt the progress that Gloria M. Arroyo had always bragged about in her past state of the nation addresses. Tomorrow, she will report again of statistical progress including her so-called achievements in mitigating, if not fully alleviating poverty in the country,” said Jun Bagasala, leader of LUPA – a member of NUPCO. 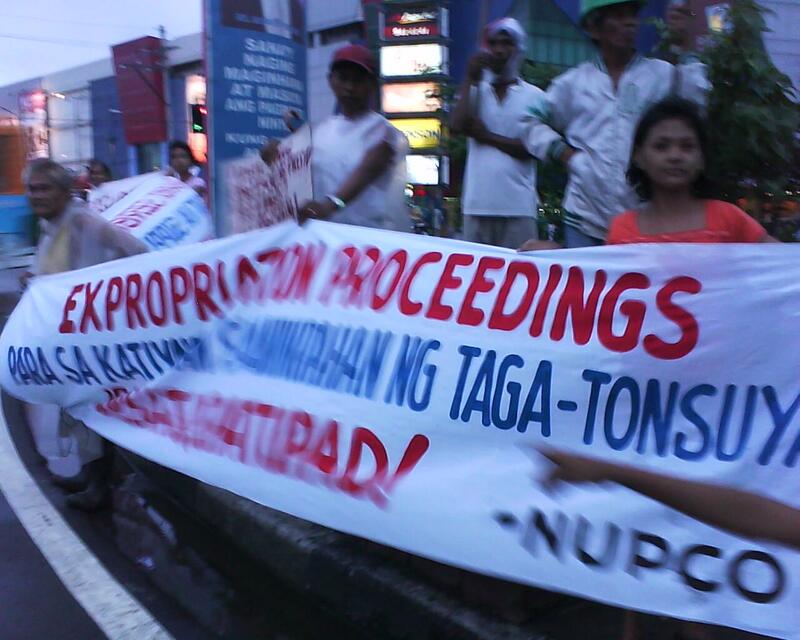 Bagasala added that as long as the land is not expropriated for socialized housing, residents will continue to face the threats of demolition and eviction from their homes as the Gozons who are the “land claimants” pursue this to be able to build a commercial complex once the area is cleared. 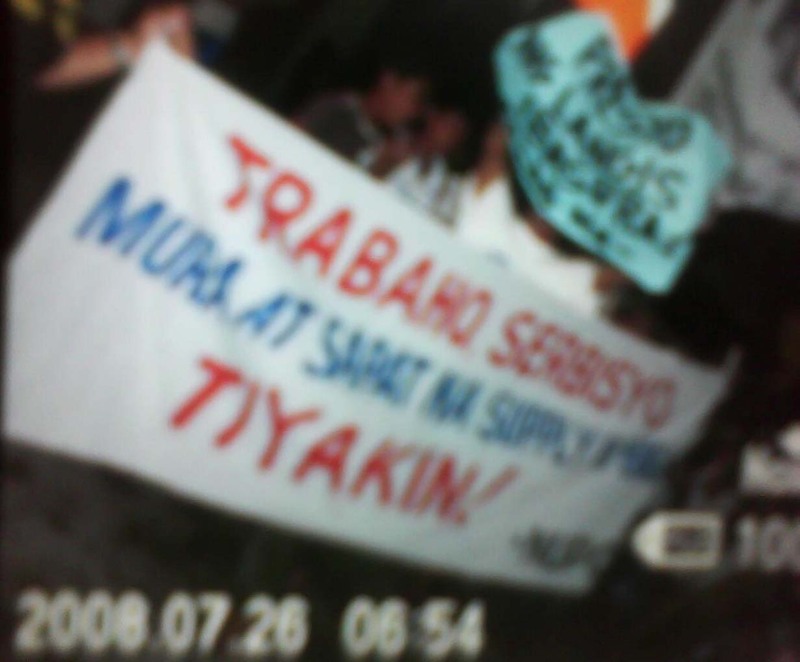 Caloocan urban poor: decent jobs, essential services, and food! 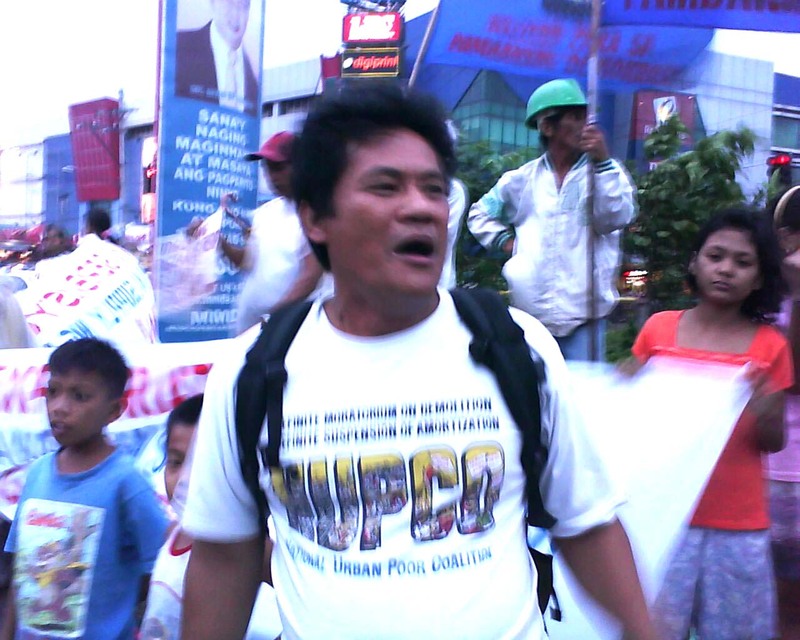 “We were relocated here more than ten years ago, but even with security of tenure in our lands and homes we still find it difficult to live here because of the absence of decent jobs as well as lack of access to essential services especially water and health,” said Nestor Yranon, chairperson of Lumaban Ka – member organization of NUPCO. “Worse, the high prices of food particularly rice, as well as oil and electricity push as all the more to our limits. We wanted to have jobs, but there is none. How can we survive with the rising costs of commodities and services with just P100 a day that we earn from vending and driving of pedicabs and tricycles?,” added Yranon. Yranon explained that their situation is a reflection of a flawed poverty alleviation including housing program of the government. He said that poor people want and need a place in the city, but the essential goods and services as well as decent jobs have to be provided also by the government. 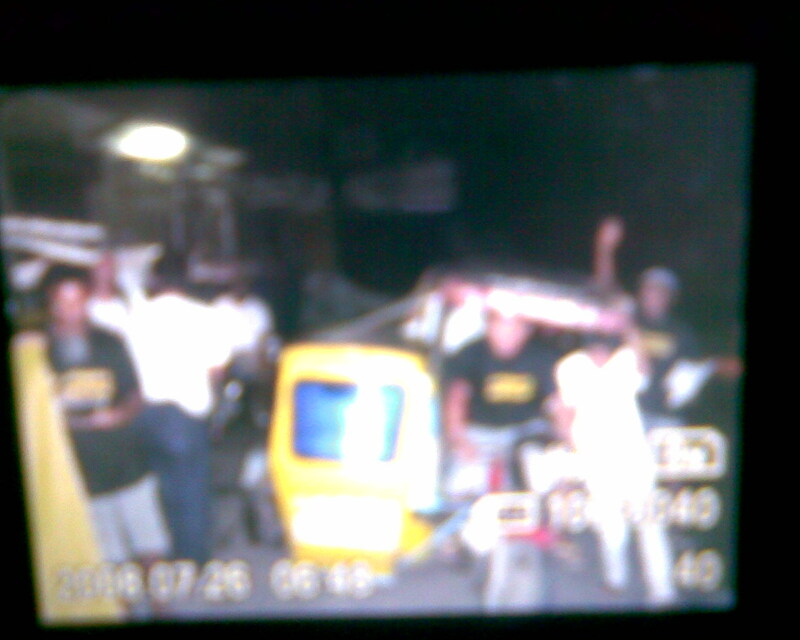 Some members of Umalab ka-Alab Katipunan, a member of NUPCO, tricycle drivers under Pagkakaisa ng mga Manggagawa sa Transportasyon (PMT), and Akbayan were among those who led the community action. 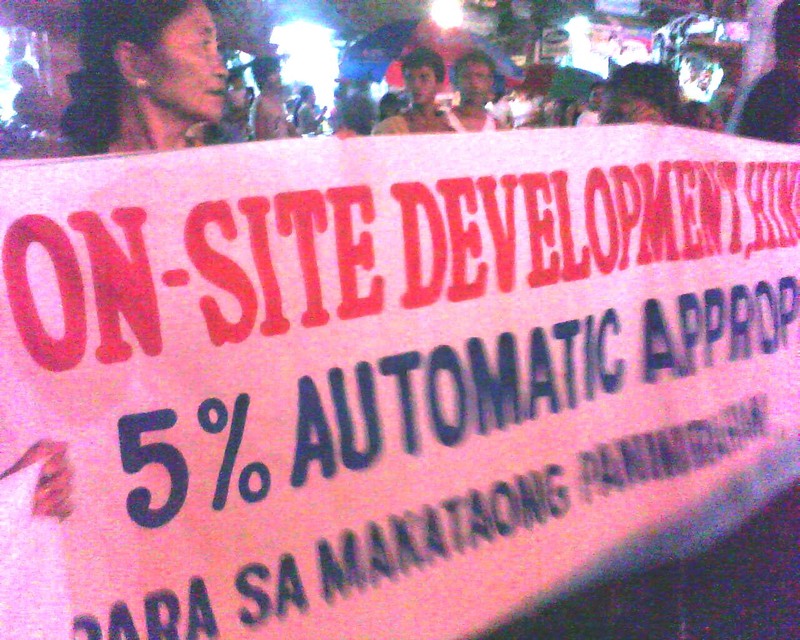 Residents of North Triangle are appealing to Vice President Noli de Castro to support their demand that the planned Central Business District of Quezon City, a commercial zoning development project covering the so-called North Triangle and East Triangle Area along North Avenue, include socialized housing for them. The residents are pushing for a mixed-use plan for the development of the area as alternative to relocating them in another place. 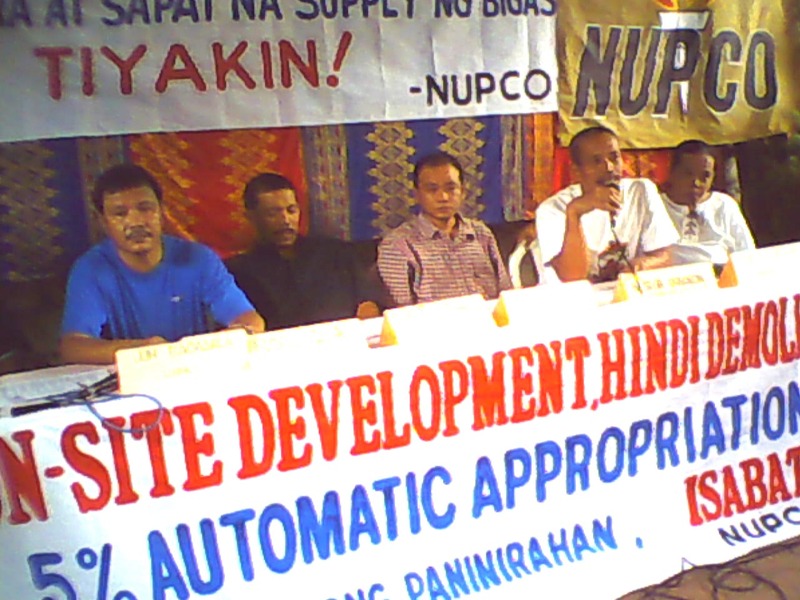 “Instead of moving 16,000 families to relocation sites far from their jobs and their source of livelihoods, the plan for the Central Business District should allocate space for medium rise buildings as affordable socialized housing for the residents,” said Edwin Nacpil, President of the San Roque Community Council – North Triangle Alliance or SRCC-NTA). “According to a World Bank study of the Central Business District Project, it will be much more expensive for the government to relocate the families living in North Triangle than to provide socialized housing through medium-rise buildings under a mixed-use plan,” added Nacpil. De Castro, Chairman of the Housing and Urban Development Coordinating Council (HUDCC), is in charge of the Urban Triangle Development Commission, which covers 250-hectare North and East Triangle areas. The Central Business District property is owned by the National Housing Authority (NHA). The Trinoma Mall, owned by the Ayalas, is one of the first malls to locate in the area. The World Bank has dubbed the CBD project as “the center of gravity of commercial developments in Metro Manila in the coming years.” The site offers the most ideal locations in terms of metropolitan access. It will be linked to at least three metro rail transit stations, and has one of the most expansive EDSA frontages, compared to other central business districts. World Bank contracted the Japanese firm, Almec, to complete the framework plan. The estimated P3 billion project will transform a largely institutional and partly blighted area into one of the most profitable and productive in Quezon City. •	Triangle Exchange is envisioned to have the highest densities of the Triangle Park. It will have commercial and residential establishments fully integrated with the transit facilities, providing the best regional links and commuter access. •	Residences at Veterans will be a mixed-use community with a residential focus. It will have a mix of housing, from high-rise condominiums to medium and lower density dwellings. Residents will have the advantage of having expansive parks nearby. •	Downtown Hub will have institutional locators (medical, training, science, etc.) integrated with commercial and residential developments. •	Emporium will focus on information and technology activities. •	Commons will consist of a park with cultural, recreational, entertainment and amenity focus.